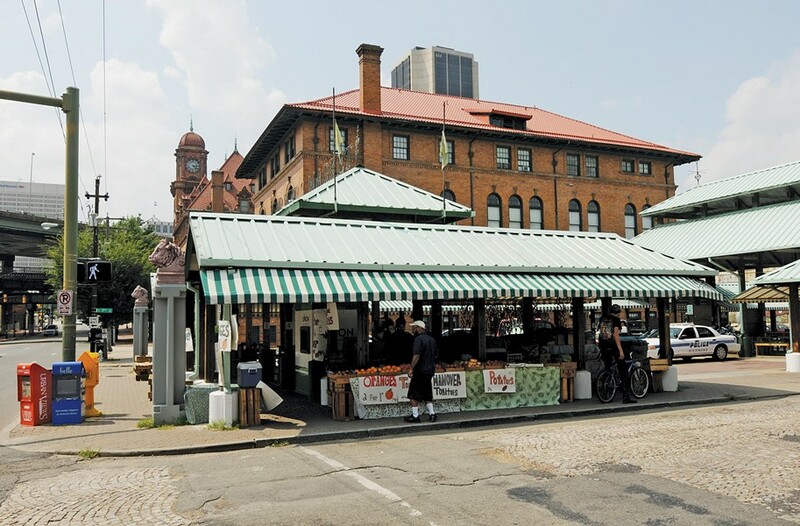 Wanted: Someone to Fix the Farmers’ Market | News and Features | Style Weekly - Richmond, VA local news, arts, and events. The city plans to turn the 17th Street Farmers’ Market in to an “open urban square” in the next two years. Say goodbye to the green roofs. The city's moving ahead with plans to radically redesign the 17th Street Farmers' Market in Shockoe Bottom. Officials requested bids Oct. 2 from architecture and engineering companies to transform the market into "an open urban square that better relates to its immediate surroundings." The new space would be multi-purpose, used for things such as "public art, family activity, outdoor dining, visual and performance festivals and daily community gathering," according to the request. The area also will continue to be used as a farmers' market, the city says. • The columned, open-air structure "hampers the shopping experience and creates a visual barrier between the facades of the buildings" on 17th Street. • Paid parking allowed inside the market "diminishes the identity of the space as a public market or gathering place." • Appearances: "potholes in the cobblestone streets, damaged and narrow sidewalks, intrusive overhead utilities, narrow sidewalk widths, etc., create the perception that this is neither an attractive nor very usable space for pedestrians or visitors." The city previously announced that it intends to turn the large shed attached to Main Street Station into a tourism and welcome center. Work's supposed to begin late this year. The request calls the goal is "a Tourism Gateway." The city has set aside $1.8 million in its capital improvement budget for the transformation of the farmers' market. It has some specific changes in mind: burying overhead wires and reworking the sewage and water systems. The firm that wins the contract must seek feedback from neighboring business and property owners, as well as collaborate with another team of designers that's working on a new streetscape for Franklin Street. Proposals are due Oct. 25. Construction would need to be complete in "2013 to late 2104," the request says. Which, given the city's oft-criticized record of delayed projects in Shockoe Bottom, we can only hope is a typo.